This system was created to give students who need a more critical level of coaching in an individual format (no more than 10) that will not only get them on track with the Big 5, hold them accountable on a monthly basis in an individual coaching sessions, but will also provide the student with all 10 of Aimy’s most popular student success coaching podcasts to guide them toward making the most of their high school career in order to maximize scholarship awards and gain college admission to some of the most prestigious institutions in America. The Platinum SOS is designed for students who are self- motivated, fire-starters who want more than a gentle push toward their success. Students who choose this package want to be prepared as much as possible to gain admission to any college as well as earn scholarships to pay for their college experiences. This one on one coaching is the most desired package for Seniors who want every advantage of customized, tailored preparation for college and career. Aimy delves into the scholarship application process on an individual basis with students who choose this package. Students apply for a minimum of 10 scholarships and Aimy personally reads and edits their applications and essays as well as teaches them to track their progress. She maintains monthly communication with the students and increases to weekly communication in the Fall-early Spring season. This package is best for serious students who are dedicated to maximizing their high school outcomes and are in their Senior year of High School. It is recommended they begin in June prior to their Senior year but no later than September for maximum optimization. It solves the problem of what can I do intensely during my Senior year to guarantee admission to college and scholarship attainment. This solves the problem of a lack of focus during the senior year but seeks to maximize students’ potential to gain multiple scholarships and high exposure to the college application process. This package helps students stay laser focused on a path toward maximizing time, staying on track academically, using resources wisely, and maintaining high grades all while completing multiple scholarship and college applications. 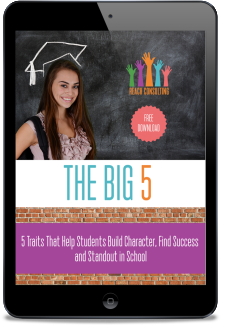 E-book on the Big 5 in its expanded form. E-workbook to help you plan out your high school career and involvement in activities that can maximize your experiences. 10 individual coaching sessions featuring a 15-minute question and answer session with Aimy. Students will apply for a minimum of 50 scholarships and Aimy personally reads and edits their applications and essays as well as teaches them to track their progress. Up to 10 College admission applications applied for with the guidance, feedback and recommendations of Coach Aimy. Students will also enjoy bi-weekly communication in the Fall- early Spring season, as this is the most advantageous time for Seniors. Review of all Explore, Plan and ACT results and PSAT and SAT tests students have taken and provide an intervention packet of information to maximize increases in scores on the future SAT/ACT tests. Who is it for: Seniors primarily but can be customized for Juniors.